The real Feldkurat in der reserve Eybl serving field mass in Podmonasterz (ukr. Підмонасти́р) in Galicia 28 June 1915. Around this time his literary counterpart Feldoberkurat Ibl served his own mass for Švejk's departing march battalion in Királyhida. Ibl was the chief field chaplain who performed the field mass in Királyhida for three departing march battalions. One of these headed for Russia, two for Serbia. His sermon didn't impress Švejk who on the train relays the mass and condemns it as idiocy squared. Ibl built the mass around a conversation between the mortally wounded soldier Hrt and marshal Radetzky at the battle of Custoza. It is also revealed that Ibl travelled on to Vienna where he repeated his sermon. The conversation was according to the author picked from a military calendar and this is true. It is almost a word-by-word copy of Der Soldatenfreundkalender 1915, page 78 and 79. Ibl is supposed to be inspired by feldkurat Jan Eybl, a military cleric who served in IR91 together with Jaroslav Hašek in the summer of 1915. During this period Eybl celebrated at least three field masses and one assumes that Jaroslav Hašek present. Still it can hardly me more than the name that associates him with the literary Oberfeldkurat Ibl. Jan Eybl's rank was the lower Feldkurat in der Reserve and he served at the front the entire period the author stayed in Királyhida (June 1915). In his advanced years Jan Eybl said that he never held a mass like the one described in the novel. Nor does it make sense that two march battalions headed for Serbia at the time Švejk was in Királyhida. During the spring and summer 1915 K.u.k. Heer didn't have troops on Serbian territory since before Christmas 1914. It was only in October 1915 that fighting on the Balkan-front flared up again. The figure in the novel may therefore have been inspired by another cleric, probably a person from K.u.k. Feldsuperioriat or a garrison in Vienna. These were assigned duties in the area around the capital and after Jan Eybl himself was transferred here in July 1918 he held a couple of masses in Bruck an der Leitha. It should noted that Ibl continued to Vienna after finishing in Bruck, indicating that he was based here. [3.1] „Milí vojáci,“ řečnil vrchní polní kurát Ibl, „tak tedy si myslete, že je rok osmačtyřicátý a že vítězstvím skončila bitva u Custozzy, kde po desetihodinovém úporném boji musil italský král Albert přenechati krvavé bojiště našemu otci vojínů, maršálkovi Radeckému, jenž v 84. roce svého života dobyl tak skvělého vítězství. Carlo Alberto is mentioned by senior field chaplain Ibl in the field mass he serves for the departing march battalion in Királyhida. Carlo Alberto was king of Piedmont from 1831 to 1849, the adversary of Radetzky at the battle of Custoza in 1848. Hrt was a standard-bearer which is featured in Ibl's field mass, a mortally wounded hero at the battle of Custoza. He had taken part in battles as early as the Napoleonic Wars, at Aspern and Leipzig. The author indicates that Ibl's speach sounds as if taken from a military calendar. Švejk is here unusually fortright in his verdict; he refers to the field mass as "idiocy squared". Hrt and his story is exactly what the author says. It is almost a word by word copy of Der Soldatenfreundkalender 1915, page 78 and 79. Here the hero is called Fahnenführer Veit, cz. Vít, one of some minor discrepancies. It must be assumed that the author had the Czech version at hand when he wrote Ibl's speech. The kalendar was published in several of the languages of Austria-Hungary. [3.1] S roztříštěnými údy na poli cti pociťoval zraněný praporečník Hrt, jak na něho hledí maršálek Radecký. Hodný zraněný praporečník ještě svíral v tuhnoucí pravici zlatou medalii v křečovitém nadšení. Joseph Ferdinand is mentioned in the conversation on the train about two battalions from the Prague based IR28 which crossed over to the Russians by Dukla on 3 April 1915 to the tunes of the regimental band. The regiment was then disbanded by a decree from Joseph Ferdinand, which text is quoted by the author. Joseph Ferdinand was an archduke of the House of Habsburg and a military commander. In 1915 he was commander-in-chief of the 4th army but was replaced due to the disastrous losses during the Brusilov offensive in 1916. After the war he was allowed to live in Austria but had to give up his rights as a noble. He was arrested by the Nazis in 1938 and spent some time in Dachau, and was only released after a personal initiative from Hermann Göring. The abovementioned episode involving IR28 did find place, albeit not as the author and numerous other sources claim. IR28 was reconstituted later that year after an investigation concluded that the incident was far less serious than first believed. New research shows that the story about the desertion appeared because of communication problems, and that there since have been political motives for keeping the myth alive. Eine genaue Analyse der im Wiener Kriegsarchiv aufliegenden Akten und Dokumente zeigt jedoch, dass vom militärischen Standpunkt aus diese Vorwürfe in keinster Weise zu rechtfertigen sind. So besetzte etwa das IR 28 im April 1915, personell wie materiell fast völlig ausgeblutet, einen fast unhaltbaren Frontabschnitt und wurde schließlich im Zuge eines Angriffs überlegener Russischer Kräfte eingekreist und aufgerieben. Kommunikationsfehler innerhalb der Befehlsstellen der k.u.k. Armee führten letztlich dazu, dass dem österreichisch-ungarischen Kriegsministerium von einer Desertion des Verbands berichtet wurde, welches daraufhin die sofortige Auflösung des IR 28 verfügte. Der tapfere Einsatz des IX. Marschbataillons des Regiments an der Italienfront sowie ein über zwei Jahre andauerndes Gerichtsverfahren, in dem die Unschuld der Offiziere und Soldaten eindeutig festgestellt wurden, führten letztlich zur Wiederaufstellung des Verbands im Dezember 1915. Aus unerfindlichen Gründen wurde die Rehabilitierung des IR 28 jedoch nie öffentlich kundgemacht, sodass sowohl in der Historiografie als auch im nationalen Gedächtnis zumeist nur die Auflösung des Regiments wegen „Hochverrats und Feigheit vor dem Feinde“ übrig blieb. [3.1] Potom Švejk počal mluvit o známých rozkazech, které jim byly přečteny před vstoupením do vlaku. Jeden byl armádní rozkaz podepsaný Františkem Josefem a druhý byl rozkaz arcivévody Josefa Ferdinanda, vrchního velitele východní armády a skupiny, kteréž oba týkaly se událostí na Dukelském průsmyku dne 3. dubna 1915, kdy přešly dva bataliony 28. pluku i s důstojníky k Rusům za zvuků plukovní kapely. Chodounský is a telephone operator who is assigned to the 11th march company at the time of departure from Királyhida. He is part if the story to the very end, particularly on the train journey to Sanok where he shares the staff carriage with Švejk, Marek, Vaněk, Jurajda and Baloun. It transpires that he has served at the Serbian front, and he mentions stoppin in Osijek on the way. In a conversation between Vaněk and Marek in Budapest there is a hint that Chodounský might be an informer. His first name "Tonouš" (nickname for Antonín) is revealed in Liskowiec when he writes two letters to his wife. [3.1] Na druhé straně vagonu proti Vaňkovi seděl kuchař okultista z důstojnické mináže a cosi psal. Za ním seděli sluha nadporučíka Lukáše vousatý obr Baloun a telefonista přidělený k 11. marškumpačce, Chodounský. Baloun přežvykoval kus komisárku a vykládal uděšeně telefonistovi Chodounskému, že za to nemůže, když v té tlačenici při nastupování do vlaku nemohl se dostat do štábního vagonu ku svému nadporučíkovi. Matějka was a kaprál who overindulged in food on the way to the front in Serbia, all according to Chodounský. This was at the very beginning of the war when food was plentiful and enthusiasm for the war was great. It happened on the way through Hungary down to the Balkans front by the river Drina. [3.1] Po všech tratích jsme nic jiného nedělali, než blili z vagonů. Kaprál Matějka v našem vagoně se tak přecpal, že jsme museli dát mu přes břicho prkno a skákat po něm, jako když se šlape zelí, a to mu teprve ulevilo a šlo to z něho horem dolem. Když jsme jeli přes Uhry, tak nám házeli do vagonů na každé stanici pečené slepice. Macek was a Czech senior lieutenant who got killed in the fighting in Bosnia. It is Chodounský who lectured about this on the train before Moson and adds that Macek spoke only German. [3.1] Přijel z druhého konce batalionskomandant a svolal všechny na poradu, a potom přišel náš obrlajtnant Macek, Čech jako poleno, ale mluvil jen německy, a povídá, bledý jako křída, že se dál nemůže ject, trať že je vyhozena do povětří v noci, Srbové že se dostali přes řeku a jsou nyní na levém křídle. Jurajdová was the the of the occultist cook Jurajda and she was now publishing a theosophic magazine. He is mentioned as the husband writes here a letter, ingeniously composed to pass censorship. Jurajda uses the name Helenka, diminutive of Helena. [3.1] Věř mně, drahá Helenko, že se opravdu snažím co nejvíce zpříjemnit našim pánům důstojníkům jich starosti a námahy. Byl jsem od pluku přeložen k maršbatalionu, což bylo mým nejvroucnějším přáním, abych mohl, byt’ i ze skromných prostředků, důstojnickou polní kuchyni na frontě uvésti v nejlepší koleje. Herold was a university professor who Švejk had played mariáš (mariáge) with at U Valšů before the war (mentioned in an anecdote). [3.1] Já konečně povídám: ,Pane Herolde, jsou tak laskav, hrajou durcha a neblbnou.’ Ale von se na mne utrh, že může hrát, co chce, abychom drželi hubu, von že má universitu. Ale to mu přišlo draze. Hostinský byl známej, číšnice byla s námi až moc důvěrná, tak jsme to tý patrole všechno vysvětlili, že je všechno v pořádku. Chodounský was, in the long anecdote on Stendler, the owner of the detective bureau where the latter was employed. Chodounský was also in real life owner of a detective agency in Prague. His firm is listed in the address book for 1910. In the anecdote he is only mentioned by his last name. [3.1] „Není ten Chodounský, co má soukromej detektivní ústav s tím vokem jako trojice boží, váš příbuznej?“ otázal se nevinně Švejk. „Já mám moc rád soukromý detektivy. Já jsem taky jednou sloužil před léty na vojně s jedním soukromýrn detektivem, s nějakým Stendlerem. Stendler was a man Švejk knew from his national service, with a cone-shaped skull, employed by the detective Chodounský. was presumably a real person as the detective agency Chodounský actually existed. How much of what is revealed in the anecdote is based on facts is however debatable. Zemek was caught in flagrante by detective Stendler, with Mrs Grotová. [3.1] A vona se otočila zády ke mně a bylo vidět na kůži, že má vobtisknutej celej vzorek toho mřížkování z koberce a na páteři jednu přilepenou hilznu z cigarety. »Vodpuste,« povídám, »pane Zemku, já jsem soukromej detektiv Stendler, vod Chodounskýho, a mám ouřední povinnost vás najít in flagranti na základě oznámení vaší paní manželky. Grotová was caught in flagrante delicto by detective Stendler, with Mr Zemek. [3.1] »Vodpuste,« povídám, »pane Zemku, já jsem soukromej detektiv Stendler, vod Chodounskýho, a mám ouřední povinnost vás najít in flagranti na základě oznámení vaší paní manželky. Tato dáma, s kterou zde udržujete nedovolený poměr, jest paní Grotová.« Nikdy jsem v životě neviděl takovýho klidnýho občana. Stach worked for Chodounský's competitor Stern and caught Stendler red-handed with Grotová. [3.1] ,A přitom jsem se,’ vyprávěl pan Stendler, ,pomalu začal vodstrojovat, a když už jsem byl vodstrojenej a celej zmámenej a divokej jako jelen v říji, vešel do pokoje můj dobrej známej Stach, taky soukromej detektiv, z našeho konkurenčního ústavu pana Sterna, kam se vobrátil pan Grot o pomoc, co se týká jeho paní, která prý má nějakou známost, a víc neřek než: »Aha, pan Stendler je in flagranti s paní Grotovou, gratuluji. Stern was the employer of detective Stach, and was entrusted by Grot to spy on his wife. Grot had commisioned the Stern detective agency to spy on his wife. The practical task was given to Stach who caught Mrs Grotová and detective Stendler with their trousers down. Ganghofer is made a pivotal figure in the staff carriage of the train between Moson and Győr through his novel Die Sünden der Väter, which is used as the key in Ságner's cipher system. The problem is simply that it is in two parts, and the officers have been given the first part instead of the intended second part. It is Biegler who discovers the mistake and embarrasses Ságner in front of his fellow officers. How it all happened is revealed in the conversation between Lukáš and Švejk at the station in Győr. The author states that it was a small book, a short story in two parts. It was indeed in two parts but it was a novel rather than a short story. Ságner also adds that "he doesn't write badly this Ganghofer", an opinion that no doubt reflects the author's own. Ganghofer was a Bavarian writer who in his time was very popular, and many of his novels have been made it to the cinema. He was one of the favourite poets of Wilhelm II. and a personal friend of the emperor. Die Sünden der Väter (The sins of the fathers) (Adolf Bonz & Comp., Stuttgart, 1886) is one of the Ganghofer's lesser known novels. Previous to its publication it had appeared as a serial in Neue Freie Presse from 5 August 1885. At the time the author lived in Vienna where he was dramatist at Ringtheater, and contributed to a couple of newspapers. Whereas most of Ganghofer's popular work was inspired and set in the Alpine surroundings of his home area, Die Sünden der Väter is an exception. It takes place in refined big city surroundings in Munich and Berlin and depicts a society that is very different from that of the Bavarian countryside. Less known is his work as war reporter from 1915 to 1917. Although he exposed the horrors of war, his perspective is different from writers like Erich Maria Remarque and Jaroslav Hašek. He was a chauvinist who expressed pleasure when the destruction did not hit his own home country, and he wrote propaganda and slogans. Die Front im Osten (link A) describes the early stages of the Gorlice-Tarnów offensive that Hašek later took part in. He includes a piece on the recapture of Przemyśl and a stay in Sambor in early June 1915 where he met K.u.k Stabsoffiziere. In the autumn of 1915 he was severely wounded, was decorated with Eiserne Kreuz but carried on as a war correspondent until 1917. His political opinions were nationalistic and antidemocratic. [3.1] Ve štábním vagoně, kde seděli důstojníci pochodového praporu, panovalo ze začátku jízdy podivné ticho. Většina důstojníků byla zahloubána do malé knihy v plátěné vazbě s nadpisem „Die Sünden der Väter. Novelle von Ludwig Ganghofer“ a všichni byli současně zabráni do čtení stránky 161. Hejtman Ságner, batalionní velitel, stál u okna, v ruce držel tutéž knížku, maje ji taktéž otevřenu na stránce 161. Marta is a character in Die Sünden der Väter by Ganghofer and appears on page 161 of the second volume of the novel. Hašek refers to her as "some Marta". Martha Kronek was one of the main character of the novel, she was an actress at Stadttheater in Munich. She is introduced after only a few pages and described as young and beautiful. Her mother also forms part of the plot. [3.1] „Pánové,“ řekl se strašně tajuplným výrazem, „nezapomeňte nikdy na stránku 161!“ Zahloubáni do té stránky, nemohli si z toho ničeho vybrat. Že nějaká Marta, na té stránce, přistoupila k psacímu stolu a vytáhla odtud nějakou roli a uvažovala hlasitě, že obecenstvo musí cítit soustrast s hrdinou role. Albert is a character from Die Sünden der Väter by Ganghofer, mentioned on page 161 of the second part, like Marta. The author refers to him as "some Albert". Richard Albert was the main hero of the novel and is introduced at the very beginning. In the serial version of the novel in Neue Freie Presse he appears already in the first part, dated 5 August 1885. He lives in Berlin, but is from Bavaria, just like the novels narrator. It is already obvious that he is well off. [3.1] Potom se ještě objevil na té stránce nějaký Albert, který neustále se snažil mluvit žertovně,což vytrženo z neznámého děje, který před tím předcházel, zdálo se takovou hovadinou, že nadporučík Lukáš překousl vzteky špičku na cigarety. Bügler was the name Cadet Biegler boasted that his forebears used. [3.1] Šel dobrovolně na vojnu a vykládal hned při první příležitosti veliteli školy jednoročních dobrovolníků, když se seznamoval s domácími poměry žáků, že jeho předkové se psali původně Büglerové z Leutholdů a že měli v erbu čapí křídlo s rybím ocasem. Albrecht (his name) is mumbled by Biegler when he hears about the ciphering-system based on the novel by Ganghofer. Here he is indirectly referred to by "Archduke Albrecht's system". Albrecht was an Austrian archduke of the house of Habsburg, field marshal and inspector general of the Austro-Hungarian army. His father was Karl von Österreich-Teschen who lead the Austrian forces against Napoléon at Aspern in 1809. It is however unlikely that this is the Albrecht that Biegler was mumbling about. Although being a prominent military leader there is no indication that he had any detailed knowledge of cryptography. Sergey Soloukh suggests that the person in question could be the Italian philosopher Leon Battista Alberti (1404 - 1472). He introduced a poly-alphabetic encryption system, albeit long before Gronveld (see Bronckhorst-Gronsveld). The chronology in Biegler's account is thus incorrect. Alberti is a prominent name in the history of cryptography and is often called "the father of western cryptography". It is therefore highly probable that Biegler (i.e. the author) got the names mixed up and actually meant "Alberti's system". [3.1] „Erzherzogs Albrecht system,“ zamumlal pro sebe snaživý kadet Biegler, „8922 = R, převzatý z methody Gronfelda.“ „Nový systém jest velice jednoduchý,“ zněl vagonem hlas hejtmanův. „Osobně obdržel jsem od pana plukovníka druhou knihu i informace. Bronckhorst-Gronsveld (i.e. his name, indirectly by the Gronsveld-method) is mumbled by Cadet Biegler when he hears about the ciphering-system based on the novel Die Sünden der Väter by Ganghofer. Bronckhorst-Gronsveld was a Dutch count and Bavarian commander who is said to have invented the Gronsveld-method for ciphering, or more precisely: the polyalphabetic method of encryption. According to some sources the invention was done by his son Johann Franz. [3.1] „Erzherzogs Albrechtsystem,“ zamumlal pro sebe snaživý kadet Biegler, „8922 = R, převzatý z methody Gronfelda.“ „Nový systém jest velice jednoduchý,“ zněl vagonem hlas hejtmanův. „Osobně obdržel jsem od pana plukovníka druhou knihu i informace. Dub was a Czech reserve-lieutenant and the biggest fool of the entire novel, disliked by officers and the rank and file alike. From around 23 May 1915 onwards he became Švejk's chief adversary but was an easy match for the cunning soldier. Dub had entered the plot earlier when Biegler revealed the gaffe about the Ganghofer books, but he is only introduced as Švejk's main enemy in Budapest, after Biegler was forced to abandon that role due to his soiled trousers and resulting "cholera". Dub was a school-master in civilian life and a keen monarchist, which made him a natural target for the author's scorn. Švejk had repeated clashes with him, but in the end had to come to his aid when he dragged him out of the whore-house in Sanok that Dub was "inspecting". Dub is part of the story all the way to the end and suffers the ultimate indignity when he is thoroughly put in place by Biegler when they approach Żółtańce. Dub lived in Královská 18 in Smíchov. In the final section of Švejk, at the vicarage in Klimontów, Dub has the honour of uttering the final lines of the book, as idiotic as always. Attempts to find a prototype for Dub have not yielded any conclusive results. Most of the classical literature about Hašek is content to mention reserve lieutenant Emanuél Michálek who was suggested as a model by Jan Morávek already in 1924. Michálek is said to have used the phrase: "You don't know me, but...". He and the author served in the same field company for six weeks in 1915 and was allegedly at odds. That said, only the rank and this famous threatening phrase seem to link the literary figure to the real reserve lieutenant. More convincing than the story by Jan Morávek is the thorough and well documented study by Karel Dub (Genealogické a heraldické listy, 2008). He concludes that the person who best fits the description of the literary lieutenant is Johann Hutzler, and that the name Dub probably was borrowed from someone Hašek knew from before the war or from České legie (19 persons carrying the surname Dub is listed in the database of the Legions, 12 of these in Russia). See Emanuél Michálek for more on Hutzler. Jan Eybl at his old age told journalists that he had served with a regimental doctor Robert Dub who also knew Hašek. The main reason to be sceptical to this story is that the doctor according to official military records only joined the company after Hašek was captured! Otherwise almost every detail that Eybl provided have been confirmed. [3.1] Kadet Biegler se mezitím díval vítězně po všech a poručík Dub pošeptal nadporučíkovi Lukášovi, že to ,Čapí křídlo s rybím ocasem’ zjelo Ságnera jaksepatří. Kerckhoffs is mentioned by cadet Biegler during teh discussion with Ságner concerning the mysterious cryptographic key. See Ganghofer. Kerckhoffs (full name Jean-Guillaume Hubert Victor François Alexandre Auguste Kerckhoffs van Nieuwenhoff) was a Dutch cryptographer and linguist, one of the founders of military cryptography. In January and February 1883 he published his best known work on cryptography, La cryptographie militaire, an article that appeared in two parts in Journal des sciences militaires. It was regarded as one of the milestones of 19th century cryptography. Here he mentions both Fleissner and Kircher. Le colonel Fleissner (Handbuch der Kryptographie) a adopté, sans modification aucune, la méthode de déchiffrement du major Kasiski. Le Père Kircher (Polygraphia nova et universalis ; Rome, 1663) a remplacé les lettres du tableau de Vigenère par des nombres, d’où le nom d’Abacus numeralis donné à son système. [3.1] „Dovoluji si,“ řekl, „pane hejtmane, upozorniti na knihu Kerickhoffovu o vojenském šifrování. Knihu tu může si každý objednat ve vydavatelstvu ,Vojenského naučného slovníku’. Jest tam důkladně popsána, pane hejtmane, methoda, o které jste nám vypravoval. Kircher was, according to Biegler, a colonel who had served in the Saxon army under Napoleón, mentioned by Biegler as the inventor of the method which was described in Kerckhoffs' book, and now in May 1915 appeared in a military train between Moson and Győr. Kircher surely does not refer to a colonel in the Saxon army, but rather the German scientist, universal genius and Jesuit father who is mentioned by Kerckhoffs in his paper La Cryptographie Militaire from 1883. His work, Polygraphia nova et universalis, 1663, is considered a principal work in cryptography. He had an enormous range of interests: Egyptology, Sinology, bible studies, geology, mathematics, medicine, astronomy, acoustics, bacteriology, to name a few. He was also a practical inventor. Le Père Kircher (Polygraphia nova et universalis ; Rome, 1663) a remplacé les lettres du tableau de Vigenère par des nombres, d’où le nom d’Abacus numeralis donné à son système. Seulement, au lieu d’écrire le texte cryptographique de la façon ordinaire, Kircher prend une page d’écriture quelconque, et indique les nombres du cryptogramme par des points placés sous les lettres, à des intervalles correspondant à la valeur des nombres obtenus. Schott a commenté le système du Père Kircher dans sa Schola stenographica ; de là que beaucoup d’auteurs, Larousse entre autres, lui en ont attribué la paternité. [3.1] Vynálezcem jejím je plukovník Kircher, sloužící za Napoleona I. ve vojsku saském. Kircherovo šifrování slovy, pane hejtmane. Každé slovo depeše se vykládá na protější stránce klíče. Fleissner von Wostrowitz, Eduard B.
Fleissner was a senior lieutenant who, according to Biegler, improved the method invented by Kircher. He is said to have used Die Sünden der Väter by Ganghofer in an example in his book. Fleissner was in real life an Austrian colonel who in 1881 published Handbuch der Kryptographie. As Fleissner published the book five years before Die Sünden der Väter by Ganghofer, the facts given by Biegler are dubious although all the names he mentions have some connection with cryptography. His book is briefly mentioned in the well known essay by Kerckhoffs from 1883. The book was not published by Theresianische Militärakademie as Biegler claims. It was in fact self-published and distributed by L. W. Seidel & Sohn. Fleissner had entered world literature even when still alive. He is mentioned in the novel Mathias Sandorf by Jules Verne already in 1885. Ces grilles, d’un si vieil usage, maintenant très perfectionnées d’après le système du colonel Fleissner, paraissent encore être le meilleur procédé et le plus sur, quand il s’agit d’obtenir un cryptogramme indéchiffrable. Ronovský is mentioned when Baloun just after arriving in Győr is so hungry that he shows signs of rebellion and Švejk finds it appropriate to put things in perspective by telling yet another story. [3.1] „Ty máš nějakýho mladýho dědečka,“ řekl přívětivě, když dojeli do Rábu, „kerej se dovede pamatovat jen na tu vojnu v 66. roce. To já znám nějakýho Ronovskýho a ten měl dědečka, kerej byl v Italii ještě za roboty a sloužil tam svejch dvanáct let a domů přišel jako kaprál. Róža Šavaňů is mentioned by Švejk when he tries to explain to Lukáš how pointless it would be to start reading a book from the second volume. As an example he said that he once read a blood-dripping adventure book in two parts about Róža Šavaňů from Bakony. Róža Šavaňů surely refers to the Hungarian robber chief József Savanyú who terrorised the area around Bakony from around 1875 until 1884. Jaroslav Hašek also writes about Savanyú in the short story Ze staré trestnice v Ilavě (From the old prison in Ilava) and in this story he is the main character. József "Jóska" Savanyú was the son of a shepherd and together with his brother he led an armed gang of robbers who were known for their ruthlessness and brutality. In connection with a church celebration on 29 June 1879 there was a shoot-out between the gang and the local police. His brother Istvan was killed but Jóska had a narrow escape. This incident appeared in the newspapers also in the Austrian part of the Dual Monarchy. On 31 August 1881 he committed a murder and in April 1882 a wanted poster was issued, and there was also an announcement in the newspapers. On 4 May 1884 he was finally arrested after having been caught in his sleep. The court case was held in Szombathely in 1886 and the verdict was given on 17 May. The gang leader was given life imprisonment and most of his accomplices given long prison sentences. There were 200 witnesses called up for the case. An appeal was lodged; first the main accused was handed a death sentence, but on 2 March 1887 the verdict was reverted to life imprisonment. Savanyú sent to the prison in Ilava (now in Slovakia) but was freed on probation after 15 years. In the year 1900 newspapers reported that he had settled in his home village and opened a carpenter's shop. Another inspiration may have been the legendary Hungarian robber Sándor Rózsa (1813-1878). His name was big enough to earn an obituary in the New York Times and there were also novels written about him. Milan Hodík and Grete Reiner assume that this is the man Švejk has in mind, but most likely the good soldier gets the two criminals mixed up. The biographical details fit much better with the bandit from Bakony, but if any books were written about him is not known. [3.1] „Já jsem byl, jak povídám,“ zněl na opuštěné koleji měkký hlas Švejkův, „taky téhož mínění. Jednou jsem koupil krvák vo Róžovi Šavaňů z Bakonskýho lesa a scházel tam první díl, tak jsem se musel dohadovat vo tom začátku, a ani v takovej raubířskej historii se neobejdete bez prvního dílu. Adamec was a metal caster from the Daňkovka plant that Švejk starts to tell Lukáš about before the latter cuts him off. Nikodém had died from galloping consumption in Budějovice bud was still on Vaněk's salary slip. [3.1] Kdyby mně ti lotři alespoň oznámili, jestli někdo není ve špitále. Ještě minulý měsíc ved jsem nějakého Nikodéma, a teprve při lénunku jsem se dozvěděl, že ten Nikodém zemřel v Budějovicích v nemocnici na rychlé souchotiny. Zyka was a squad leader who didn't have the slightest overview of his squad, something which created disorder in Vaněk's papers. [3.1] A nejhorší je u nás ten cuksfíra Zyka. Samý žert, samá anekdota, ale když mu oznamují, že je Kolařík odkomandován z jeho cuku k trénu, hlásí mně druhý den zas týž samý štand, jako by Kolařík dál se válel u kumpanie a u jeho cuku. Kolařík was a soldier who had been moved from Zyka´s squad without it showing in Vaněk's papers. Kozel was a postman Švejk told Baloun about in an anecdote. [3.1] Teď si představ, že by tu šunku z feldpošty poslali k nám do kumpačky a my jsme si s panem rechnungsfeldvéblem každej uřízli kousek, a vono by nám to zachutnalo, tak ještě kousek, až by to s tou šunkou dopadlo jako s jedním mým známým listonošem, nějakým Kozlem. Měl kostižer, tak mu napřed uřízli nohu pod kotník, potom pod koleno, potom stehno, a kdyby byl včas neumřel, byli by ho vořezali celýho jako prasklou tužku. Vomel was Baloun's cattle boy at home who had warned him about the consequences of gluttony. [3.1] Měl jsem doma starýho čeledína Vomela a ten mě vždycky napomínal, abych jen tak nepejchnul, necpal se, že von pamatuje, jak mu jeho dědeček vypravoval dávno vo jednom takovým nedožerovi. Šeba was a senior lieutenant that Švejk knew from his time as a military servant for Lukáš in Prague. This story puts Baloun in his place for having eaten his masters lunch, and Švejk emphasises how well he treated his obrlajtnant compared to how Šeba's servant treated his superior. [3.1] Tak si vybral ten den nadívané holoubě. Já jsem si myslel, když mně dali půlku, že by si snad mohl pan obrlajtnant myslet, že jsem mu druhou půlku sežral, tak jsem ještě jednu porci koupil ze svýho a přines takovou nádhernou porci, že pan obrlajtnant Šeba, který ten den sháněl oběd a přišel právě před polednem na návštěvu k mýmu obrlajtnantovi, se taky najed. Matušič was orderly by Švejk's march battallion and appears regularly in the plot from now on, without ever playing a prominent role. He is playing cards with Batzer when Biegler wakes up from his legendary dream on the train to Budapest. In the dream he features as an angel and with Batzer he throws Biegler in the latrine on order from the Lord himself. Matušič may well have a real life model. Hašek was transferred to the front with the 12th march battalion of the 91st infantry regiment, so the orderly of this unit could have been the inspiration. Given the author's usual projection of real field units into literary march units, the model should be looked for amongst Čeněk Sagner's battalion messengers by the 3rd field battalion of IR91. Woinovich is mentioned in connection with post-cards the 11th march company has been given as compensation for the salami they were promised. The author correctly states that Woinovich was head of the War Archive. This is revealed during the tense conversation between Ságner and Biegler at the Győr railway station. Woinovich was a Austro-Hungarian general and military historian of Croatian descent who until 1915 was director of the War Archive in Vienna. Has was also author of 11 books, mainly on war history. A street in Vienna has been named after him. [3.1] Kadet Biegler podal veliteli batalionu dvě z těch pohlednic, které vydávalo ředitelství Vojenského válečného archivu ve Vídni, kde byl náčelníkem generál pěchoty Wojnowich. Na jedné straně byla karikatura ruského vojáka, ruského mužika se zarostlou bradou, kterého objímá kostlivec. Grey is mentioned in connection with post-cards the 11th march company were given as compensation for the salami they were supposed to get on the way from Budapest eastwards to the front. One of the post-cards depicts Grey dangling from the gallows. He is also the target of a hate-poem from the collection The Iron Fist by the poet Greinz. Grey was British foreign secretary from 1905 to 1915 and played an important role in the events the led to the outbreak of war in 1914, although his diplomacy failed. He is criticized for not having communicated clearly to Germany that an invasion of Belgium would lead to war with Britain, but on the other hand he is given credit for persuading Italy to join the war on the side of the Entente. [3.1] Nahoře bylo: „Viribus unitis“ a pod tím obrázek, jak na šibenici visí Sir Edward Grey a dole pod ním vesele salutují rakouský i německý voják. Greinz is mentioned in connection with post-cards the 11th march company has been given as compensation for the salami they should have got. Greinz is quoted from a poetry book, "The iron fist". Little jokes about our enemies, which contains a macabre poem about the British foreign secretary Sir Edward Grey. Greinz was an Austrian author who in 1915 published the poetry book Die eiserne Faust. Marterln auf unsere Feinde.. A poem from this collection is quoted in the novel. The poem called "Grey" is quite accurately reproduced but Hašek seems to have got the translation of the book's title wrong: He translates "Marterl" as a "small joke" but it is actually a roadside shrine, often to commemorate someone who has died in an accident on that spot. A more common German word is "Bildstock". These shrines are commonplace in Austria, Bavaria and the Czech Republic. Another source of confusion is that the end quote of the book's title is in the wrong place (surely not the author's) fault), giving the impression that it is simply called "The Iron Fist". [3.1] Básnička dole byla vzata z knížky Greinzovy: „Železná pěst“. Žertíčky na naše nepřátele, o kterých říšské listy psaly, že verše Greinzovy jsou rány karabáčem, přičemž obsahují pravý nezkrocený humor a nepřekonatelný vtip. Judas Iscariot is mentioned in the poem by Rudolf Greinz about Sir Edward Grey. Judas Iscariot was according to the New Testament one of the twelve original apostles of Jesus. He is best known for his role in betraying Jesus into the hands of Roman authorities. The name is a Greek form of Judah and has since been used as a synonym for betrayer, exemplified in this poem about Grey. 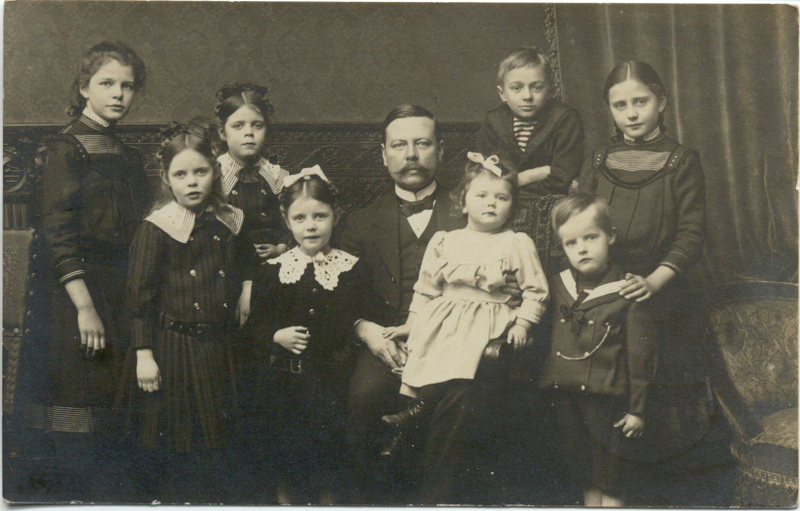 Ritter von Herbert signed a telegram containing orders about imminent departure to the front in Sokal. Captain Ságner received it at Győr station. Ritter von Herbert had dispatched a number of these telegrams, no encrypted. The telegram in question was also copied to a march battalion of the 75th regiment. The military station commander Zykán then informed Ságner that he had received a secret report from Divisional HQ that the brigade commander had gone mad and had been sent to Vienna. All his telegrams were to be ignored. Ritter von Herbert was according to the novel an Austrian general and commander of the brigade IR91 belonged to. His name is not found on any list of brigade commanders, so Ritter von Herbert is obviously a fictive person. Nor would a general have been in command of a brigade, these units were usually commanded by colonels. It is still possible that the author picked the story from real life; many officers broke down and reported sick in the course of the war. In "Ordre de bataille" from 3 July 1915 Oberst Schubert is commander of the 17th infantry brigade, the unit that IR91 reported to. He was replaced by Oberst Johannes von Mossig on 17 July. On 13 September he in turn was replaced by Oberst Alfred Steinsberg. Mossig however took up the position again a few weeks later as this was a temporary shift caused by illness further up the command chain. The beginning in the next chapter continues the story of the insane brigade commander, and gives an interesting clue. There is talk about constructing a bridge across the Bug. IR91 was actually ordered to do this on 20 July (by Kamionka Strumiłowa), but were prevented by flooding, and that night they got a sudden order to march to Sokal. Could Schubert have been replaced due to ill health and thus served as an inspiration for Hašek's "Herbert"? As often happens in this (and other) novels the author used his licensia poetica to juggle events and facts. The order to build a bridge and suddenly march is authentic, but that this order was given to the march unit way behind the lines is pure mystification. No march battalion was ever involved in any of the operations by the Bug and Sokal, as they were usually dissolved as they reached the front where the newly arrived troops joined the main body of the regiment. There is also another timing conflict: the 14th march battalions, including that of Infanterieregiment Nr. 75, were only moved to the front in September, more than a month after the battle of Sokal, and at the time when the front had been pushed further east, by Dubno. [III.1] První telegram musel být odevzdán, třebas měl obsah velice překvapující, když je batalion na stanici v Rábu: „Rychle uvařit a pak pochodem na Sokal.“ Adresován byl nešifrovaně na pochodový batalion 91. pluku s kopií na pochodový batalion 75. pluku, který byl ještě vzadu. Podpis byl správný: Velitel brigády: Ritter von Herbert. [III.2] „Ten vyváděl, ten váš brigádní jenerál,“ řekl, chechtaje se na celé kolo, „ale doručit jsme vám tu blbost museli, poněvadž ještě nepřišlo od divise nařízení, že se jeho telegramy nemají dodávat adresátům. Kraft was Cadet Biegler's favourite author. This is revealed in Biegler's disastrous conversation with Captain Ságner as the train leaves Győr for Budapest. Biegler was just then reading Kraft's Self-Education for Death for the Emperor. Kraft (Rudolf Karl Emil Kaspar Robert Kraft) was a German professor who enlisted as a volunteer when the war broke out. He was shot in the temple by Anloy in Belgium three weeks later, and died immediately. Hašek's description of the book is imprecise. Kraft's book, a collection of letters and diaries, was published in 1915, i.e. after his death. It was also a question of death for the fatherland, not for the emperor. An English translation by Kenneth Kronenberg is available online. Selbsterziehung zum Tod fürs Vaterland. Aus den nachgelassenen Papieren des Kriegsfreiwilligen Prof. Udo Kraft. Amelang is mentioned in a footnote by the author, as the publishing house in Leipzig that published the book by Udo Kraft. Amelang founded the publisher's C.F. Amelang. They specialised in school text books, pedagogy, and history of literature. It was founded in 1806 and in 1924 merged with two other publishers to become Koehler & Amelang GmbH. [3.1] Udo Kraft: Selbsterziehung zum Tod Für Kaiser. C.F. Amelang’s Verlag, Leipzig. Mazzuchelli is mentioned in cadet Biegler's notebook containing sketches of historical battle grounds. In this case it is regarding the battle of Trutnov. 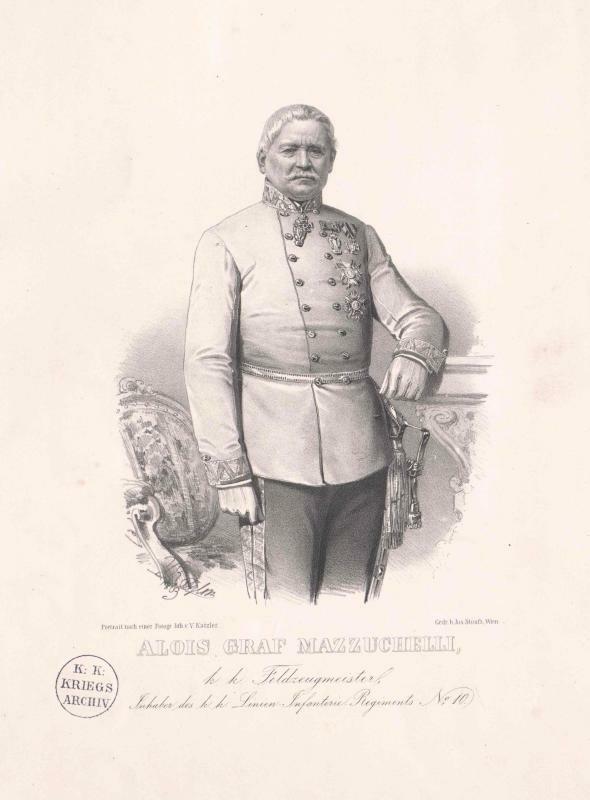 Mazzuchelli was an Austrian general who was pensioned in 1844 so that he commanded a division in the battle of Trutnov 27 June 1866 is out of question as he was 90 years old. Mazzuchelli was known as the proprietor of IR10 already from 1817 but it is unclear whether this regiment took part in the battle. Benedek is invoked by Ságner when he contemptuously calls Biegler "You Budweiser Benedek!" Benedek was an Austrian general and commander in chief of the Austrian forces during the Prusso-Austrian war of 1866. He was blamed for the disastrous defeat, immediately pensioned and put before a court martial. The trial was stopped by emperor Franz Joseph I. The Benedek barracks in Brucker Lager are named after him. [3.1] „Podle vás bitva u Trutnova,“ řekl s úsměvem hejtman Ságner, vraceje sešitek kadetovi Bieglerovi, „mohla být svedena jedině v tom případě, kdyby Trutnov byl na rovině, vy budějovický Benedeku. Zykán was a Czech who was station commander in Győr, and he had attended cadet school with Ságner and Lukáš in Prague. He and Ságner had a conversation at the station where it is revealed that even Ságner at that time had been a Czech nationalist, but had later toned it down to promote his career. Batzer was the servant of Captain Ságner and came from the area around Kašperské Hory. He and Matušič are playing cards in the carriage where Biegler fight through his dream on the train to Budapest. These two discover the pungent disaster in Biegler's trousers and call their superior. Matušic and Batzer also appear in the dream as arch angels. The author gives three dialect samples from Batzer, and he doesn't hide his dislike for this "horrible" variant of German (it is Bavarian). [3.1] Šel kolem zadního kupé, kde hrál batalionsordonanc Matušič se sluhou velitele praporu Batzerem vídeňskou hru šnopsa. Dívaje se do otevřených dveří kupé, zakašlal. Otočili se a hráli dál. „Nevíte, co se patří?“ otázal se kadet Biegler. „Nemoh jsem,“ odpověděl sluha hejtmana Ságnera Batzer svou strašnou němčinou od Kašperských Hor, „mi’ is’ ď Trump’ ausganga". Schwarzenberg enters the dream of cadet Biegler when he deals with the Battle of the Nations by Leipzig in 1813. Schwarzenberg was an Austrian nobleman, diplomat and Field Marshal. He was commander of the Austrian forces at the battle of Leipzig in 1813, and the following year he led his forces into Paris. Karl Schwarzenberg hailed from the Bohemian branch of the family. The battle was a decisive defeat for Napoleón. Merveldt enters the dream of cadet Biegler when he deals with the Battle of the Nations by Leipzig in 1813. 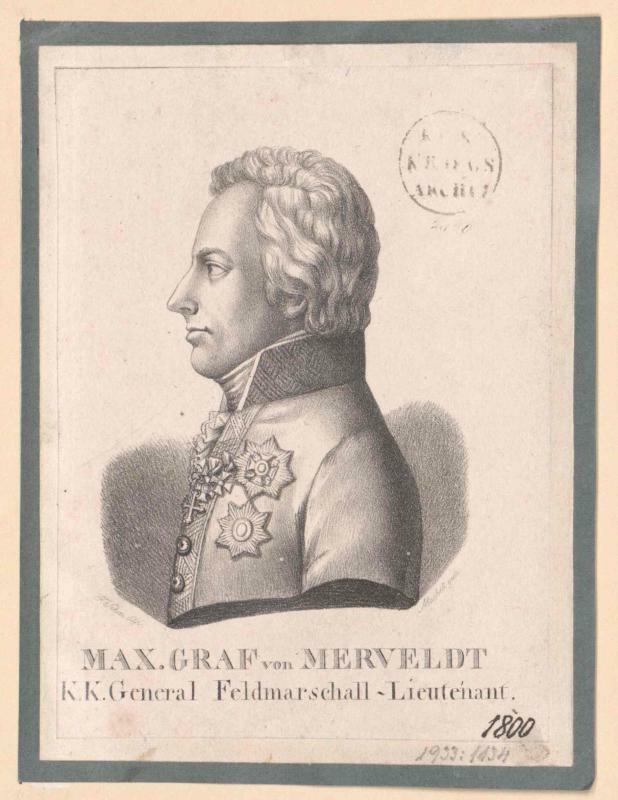 Merveldt was a German diplomat and general who served Austria. He commanded an army at the battle of Leipzig, but was captured after approaching a group of Poles and Saxons he thought were Hungarians. He died when he was ambassador in London, and was given a honorary burial in Westminster Abbey. Dankl enters the dream of cadet Biegler, there is a portrait of him hanging on the wall of the K.u.k. Gottes Hauptquartier. Dankl was an Austro-Hungarian general and one of the principal military leaders between 1914 and his retirement in 1916. He was commander of the 1st army by outbreak of war and was supreme commander at the battle of Kraśnik, the first battle the army of Austria-Hungary won. In 1915 he become commander of the Austro-Hungarian forces on the Italian front, and did a good job until he was replaced in 1916 due to poor health. Friedrich enters the dream of cadet Biegler, there is a portrait of him hanging on the wall of the K.u.k. Gottes Hauptquartier. Friedrich was an Austro-Hungarian general and archduke, known for his immense wealth. From 1914 to 1917 he was Inspector General of the Royal and Imperial armed forces and thus formally held the highest position, but in reality Conrad had the decisive power in operational matters. Towards the end of the war Friedrich had become very unpopular, accused of military incompetence and for having used the war to enrich himself. The successor states of Austria-Hungary confiscated nearly all his property. He was the brother of Karl Stephan. Welfer was a "war doctor" who had lived very well as a student on a grant from a deceased uncle. He would receive the grant every year until he had graduated. The pay-out was four times higher than an expected salary so the studies dragged on until the war wrecked it all. Now, in Budapest, he had to see to Cadet Biegler who had shitted his trousers full after his nasty dream on the train. [3.1] K batalionu byl přidělen „válečný doktor“, starý medik a buršák Welfer. Znal pít, rvát se a přitom měl medicinu v malíčku. Prodělal medicinské fakulty v různých universitních městech v Rakousko-Uhersku, i praxi v nejrozmanitějších nemocnicích, ale doktorát neskládal prostě z toho důvodu, že v závěti, kterou zanechal jeho strýc svým dědicům, bylo to, že se má vyplácet stud. mediciny Bedřichu Welferovi ročně stipendium do té doby, kdy obdrží Bedřich Welfer lékařský diplom. Koch was a captain (or major) who had died of cholera and was to be buried together with Biegler (who the doctors though would soon die). One of the doctors had earlier referred to Koch as a major. It is also mentioned that Koch has the same surname as the inventor of the cholera germ. NB! The English translator Cecil Parrott has "corrected" the discrepancy between "captain" and "major". [3.1] „To, co mluví, jsou jeho poslední slova,“ řekl štábní lékař k sanitnímu poddůstojníkovi maďarsky, „zítra ho pochováme s majorem Kochem. Teď upadne do bezvědomí. Listiny jsou o něm v kanceláři?“ „Budou tam,“ odpověděl klidně sanitní poddůstojník. „Ei-ei-ne-ne De-de-de-deck-ke-ke,“ jektal za odcházejícími kadet Biegler. V celém pokoji bylo na šestnácti lůžkách pět lidí. Jeden z nich byl nebožtíkem. Zemřel před dvěma hodinami, byl pokryt prostěradlem a jmenoval se jako objevitel cholerových bacilů. Byl to hejtman Koch, o kterém se štábní lékař zmiňoval, že bude míti zítra pohřeb s kadetem Bieglerem.